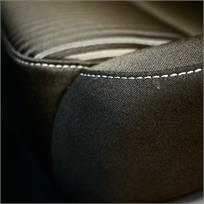 Protect Fabric Seats & Upholstery From Stains. Fabric seat covers and carpets are highly susceptible to staining from accidental spillages, sun creams, oils from our skin, foodstuffs and even mud, so it's imperative to offer fabric upholstery protection from these contaminants. Gtechniq, home of Smart Surface Science combine nanotechnology and antibacterial expertise to thoroughly clean fabrics and provide comprehensive, long-lasting protection. Gtechniq I2 Tri-Clean cleans interiors, killing 99.9% of bacteria and absorbing lingering odours. Fabrics are then protected using Gtechniq I1AB Smart Fabric sheathing fibres in a protective coating so spilled liquids are forced to bead, sitting on the surface of the fabric instead of soaking in. These beads can then be easily absorbed by cleaning cloths or paper. In addition, I1AB has a persistent antimicrobial function – perfect for family cars where small, sticky fingers and or the family dog are transported! Seats, carpets, mats, parcel shelf, hood-lining & boot space vacuumed to remove loose particles. All fabrics cleaned using Gtechniq I2 Tri-Clean Universal Cleaner solution. Fabrics allowed to dry thoroughly. Fabrics protected using Gtechniq I1AB Smart Fabric.